I am constantly reminded of the importance of communicating effectively. And I am repeatedly convinced that a simple message delivered in a simple way is most effective. 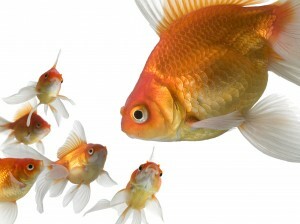 Give a man a fish and you feed him for a day. Teach a man to fish and you feed him for a lifetime. – Chinese proverb. As knowledge management professionals, we want to encourage sharing and the dissemination of knowledge throughout our organizations. We know how hard it can be to do that and to encourage people to do the same. You may have set up wonderful systems and resources to help promote this, but sometimes it may seem that you just can’t reach everyone with the “good word” of KM. Don’t be frustrated. Be creative. Here’s a little tip that I have been doing for years. Before I travel, I check my LinkedIn connections in the area where I’m going. It helps remind me who I’m connected with and it gives me an excuse to catch up with an old friend or colleague. On a recent flight from Chicago to New York, I realized that there is a lot of important information to process when traveling. There’s also a lot of unimportant information – noise. I sat in the emergency row, so I had even more to process than some of the other passengers (e.g., the emergency exit door weighs 50 pounds and it needs to be completely removed prior to exiting). 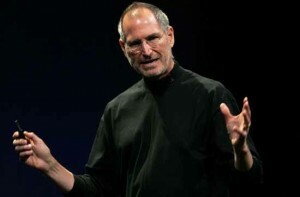 To the contrary, I don’t hate PowerPoint presentations (or Apple Keynote presentations, for that matter). I do feel a bit tortured when someone misuses PowerPoint to kill an otherwise good and interesting presentation. I’m not alone, of course. So many of us have been subjected to so many bad presentations that some people have sworn off PowerPoint altogether. But for you presenters out there, my advice is: don’t give up hope. Just give up the bad practices that make bad PowerPoint presentations. So here are a few points I think are important. I certainly won’t cover all there is to know about making presentations. I’m no expert, but there are some great expert resources out there (see below for a list). Who has the time to read lengthy blog posts? Enumerative posts are usually short and concise (I have a thing for concision). They have numbered headings, so they’re skim-able. By the way, lack of time to read good stuff is why I love to use Instapaper, a bookmarking tool that let’s you quickly mark web pages to read later. It’s dead simple. Set up a free account, install the bookmarklet, and click it when you’re on a web page that you want to read later. When you have the time, visit Instapaper (on the web, iPad, or mobile device) to get a nice text-only, super-readable version of the article. Here is a New York Times article about it. * But I digress. On Thursday, August 26, 2010 at 2:00 p.m., I’ll be moderating a panel called “How to Increase the Use of Knowledge Management Tools” at the 2010 International Legal Technology Association (ILTA) conference in Las Vegas, Nevada at the Aria Hotel & Casino. Attend this informative and practical presentation and you’ll learn how some of the top legal KM professionals ensure the successful use of KM tools at their firms. Tips include: effective communication, training, branding & marketing, and measuring & feedback. What does your firm do to ensure that KM tools are fully adopted and used properly? A firm-wide e-mail announcing your new “KM solution” is not enough. This session is targeted to firms with established KM programs, but where there is an ongoing struggle to ensure the KM department is visible and understood. You’ll learn to market, sell and make the business case for your KM tools. You can download the presentation materials and get more information about the session on the ILTA website. If you have questions for the panel prior to the session, you can contact them via the links above, or via Twitter. Please use the hashtags #ILTA10 and #KMtools in your tweets. Everyone knows FYI — short for “For Your Information.” People have a habit of sending emails with FYI as the subject, or forwarding emails with FYI as the only thing they contribute. I dislike FYI — and try to avoid using it myself — because it is ambiguous. This blogger really hates it. Most of the time people use it, they actually want you to do something or take some action – they don’t just want you to have the information. Maybe they want to speak with you about the content of the email. 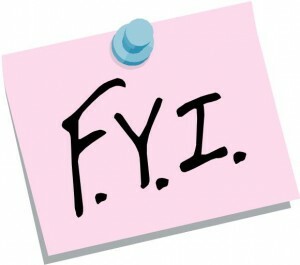 Maybe it’s information about an upcoming meeting — a time change, perhaps — that you need to know to alter your behavior. Another problem with FYI is that it implies low priority, or unimportance. If I have 30 new email messages in my inbox, and one simply has FYI as the subject line, you can be sure I’m reading it last. As much as I dislike it, I know that it’s here to stay. So, as they say, “if you can’t beat ’em join ’em.” I’m not sure that I’ll completely adopt the FYI practice, but I’ll join in the concept by proposing a counter acronym: YAR. YAR is short for “your action required.” Unlike FYI, the meaning is clear. And unlike FYI, it’s not to be used as the only thing in an email subject line or the only thing that you contribute to an email forward. YAR is an indicator. It’s like the “urgent” flag that you can add to emails in Microsoft Outlook. But it’s right there in the email itself. If you see YAR in an email, you should read it first, because you have something to do. How do you get people to respond to your emails? Have any other tips to help promote clear communication? Please share. Buzz is being rolled out over time, so if you don’t have it yet, don’t panic. Be patient. It’s impossible to resist a comparison to Twitter. But, Buzz is more than just a Twitter clone. It’s sort of a Frankenstein’s Monster of web applications: part Twitter, part instant messenger, part email, part discussion forum, part social media aggregator, part rich media delivery tool, and part location-based social network. Too much to cover here. You can also read this good article about it from the New York Times. Google Buzz is integrated into it’s popular (176 million users strong) Gmail email service. This means more of a centralized hub for this new pastiche of communication. It also means that it won’t be ignored (like Google Wave? and Google Latitude?) because the Buzz link appears right under Gmail’s inbox link. Integration with Twitter. 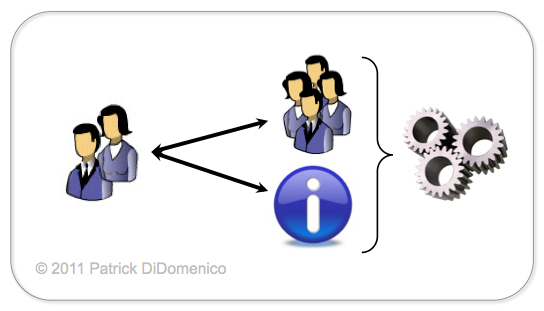 If you connect your Twitter account (also Picasa, Flickr, and Google Reader) with Buzz, your tweets flow to your Buzz stream. Double your pleasure. Integration with Google Reader. Increasingly, Reader is becoming the filter from which I find interesting content on the web. With Buzz, I can use the Reader “share” feature to send items right into my Buzz stream so others can enjoy the good content, as well. You can follow me on Google Reader here. Mobile access & LBSN features. Google’s first swing at Buzz for mobile is impressive. It shows a list view and a decent map view of nearby Tweets Buzzes (see pics above). 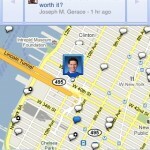 This will help Google overcome their failed attempt at LBSN (i.e., location-based social networking (see Google Latitude). Lookout FourSquare? The @ factor. Like Twitter, you can direct a Buzz to a user by using the “at” symbol as a prefix to an email address. So, to send someone a Buzz, type @email_address@gmail.com in the Buzz box. Direct messaging? As noted, there is an @ function, but it is not readily apparent whether there is a direct (private) message shortcut function (the equivalent of using the “d” in Twitter). You can send a private message to “a small group of your closest friends,” (see the video) but doing so is just a tad cumbersome. Shortcut, please. Searching email also searches Buzz items. Gmail’s ability to quickly search your email items is one of it’s best features. As of this morning, search results included Buzz results. Not good. Google should be able to fix this (and there may already be a filter for it). But the default search should exclude Buzz results, or Google should simply include a button to select the content to search. Buzz to email. 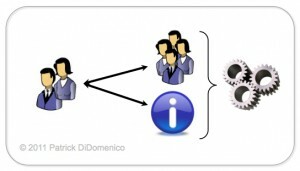 Some users have already complained of being inundated with email because Buzzes are going right into their inboxes (rather than into the separate Buzz location). This is designed to happen when someone comments on your Buzz or sends you an “@ message” – so that you don’t miss it. There should be an option to disable this feature. Speaking of comments… everything in moderation, please. This is not Twitter: people can comment on your Buzzes. Sounds great, unless you follow someone like Robert Scoble or Pete Cashmore (of Mashable), then it’s WAY too much information. 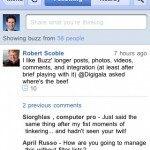 A recent Buzz by Scoble elicited 100 “likes” and 145 comments. Scrolling down through all those comments to the next Buzz took a while. And I hate to say it, but a lot of those comments were meaningless blather. Buzz needs a “show/hide” comments link (default view to hide) to avoid this. Long posts: Again, this is not Twitter. There is no 140 character limit on what you can Buzz about. Scoble said he likes this, but I disagree. Twitter has gotten us used to short messages. 140 characters may be too short, but I don’t want to read War and Peace in someone’s Buzz post. Maybe there is a limit, but I couldn’t find it. A butterfly? (See the video) I get it, I get it: social butterfly. But shouldn’t Google have used a bee or a hornet as the mascot? As a preemptive strike, I’ll just say that the Google Buzz integration with Gmail had better not mess up my Gmail contacts!!! There’s already enough frustration with that as it is. That’s it – quick and dirty. If you’re using Google Buzz, then let’s connect. Find my Buzz information on my Google Profile. I’ve also created a LinkedIn Group called Google Buzz where people can discuss it (in a less buzzy, old-school discussion- forum-type of way), so join that too. 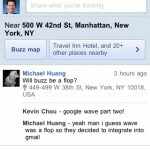 So, what are your thoughts about Google Buzz? Please comment below. There are many reasons to love Twitter. One reason is that we love to share, and we love to help others. And we love to get credit for sharing and helping. After all, there are no “anonymous donors” on Twitter. Finding that great article, YouTube video, or funny picture is exciting enough, but when you get credit for sharing it and starting the viral spread of such amazing stuff in the Twitterverse, well it just feels good. Well Twitter People, that song was my selection. Of all the other songs I could have played, I chose that one. It’s awesome. I found it. And I shared it with you. You’re welcome. 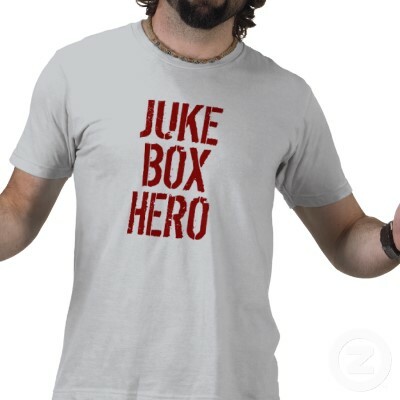 By the way, there is no such thing as the Jukebox Hero Theory of Social Media – I just made it up. But as it turns out, there is some research behind the concept of how helping people makes you feel good. According to Allan Luks and Peggy Payne it’s called the Helper’s High, “a feeling of exhilaration and a burst of energy similar to that experienced after intense exercise, followed by a period of calmness and serenity.” They discuss it in their book, The Healing Power of Doing Good. So, why else do you Tweet? You can buy that really cool t-shirt on Zazzle. It’s not mine and I have no financial interest in it. I just think it’s cool. Plus I wanted to get credit for letting you all know about it. Because it makes me feel good.